This Mustad 9" Boning Fillet Knife with Sheath is constructed with high quality materials. The large boning style blade is made with high grade German stainless steel that is coated with DuPont™ Teflon® which adds corrosion resistance and allows the blade to slide effortlessly through the fillet. The large handle features an ergonomic comfort design with a durable polypropylene soft, no-slip grip. 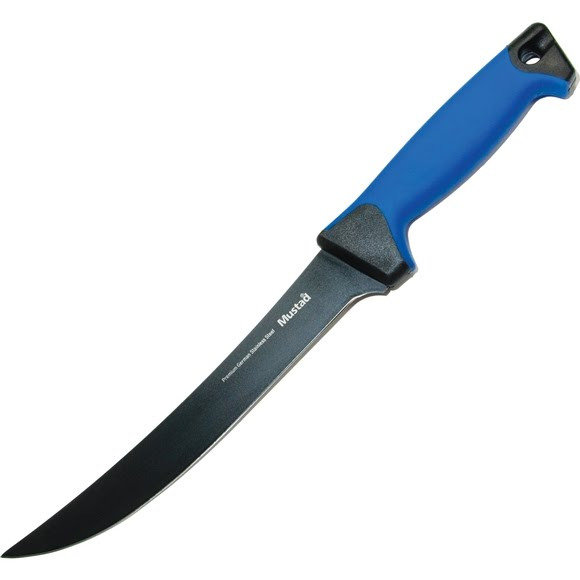 This Mustad 9" Boning Fillet Knife with Sheath is constructed with high quality materials. The large boning style blade is made with high grade German stainless steel that is coated with DuPont™ Teflon® which adds corrosion resistance and allows the blade to slide effortlessly through the fillet. The large handle features an ergonomic comfort design with a durable polypropylene soft, no-slip grip. This knife also includes a durable, rigid safety sheath with thumb lock.